This is the knob on the left side of LPL 4x5 enlargers that is used to secure the carriage in place on the column. The knob is secured on the shaft by a small D-shaped spring clip. With heavy use, the plastic collar holding the clip wears or splits, at which point the knob turns with no effect. If your original knob is broken, this is the correct OEM replacement. Includes securing clip. 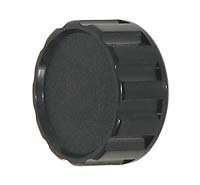 For school and institutional situations in which the enlargers get heavy use, we also have a heavy-duty replacement knob - please see Related Products below.